Today was the last day of school. The kids are already fighting over who gets to play with the computer. Yikes. Can anyone say rest time? Yep. Good call. 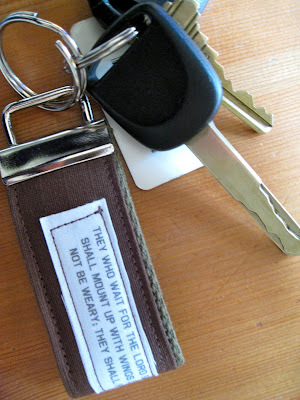 Last week, I received a request for 15 manly key fobs. Since I'd never made a "manly" key fob, I spent some time trying to figure out how to make these as guy's guy as possible. I think they turned out masculine and "cool" and decided to offer them on etsy. Here's the link. They are only 3 inches long (as long as a key) but big enough to see the scripture or quote. Just about the length of a key. What a great idea, how neat. Very creative! I can't wait to look around at more! for some weird reason.. can't see your followers button..as soon as it's back i will follow you..